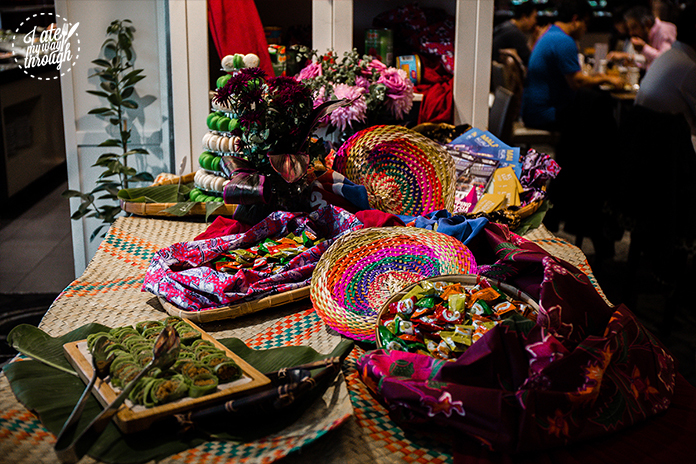 What I love about Sydney’s food scene is the diverse exposure you can have to various cuisines and cultures, and what a time it is for us Sydneysiders, as it is the first ever Malaysian Food Week held from 26 May to 1 June at Shangri-La Hotel, Sydney. I’ll be completely honest, my knowledge on Malaysian food is quite limited… just like my experience (think Pappa Rich and Mamak 😂) so going into Café Mix at Shangri-La Sydney was an experience that opened both my palate and curiosity into the world of Malaysian cuisine. In order to bring a true authentic experience to Sydney, the hotel had flown in guest chefs Anis Rusydan Bin Amran and Azman Bln Mat Hasan of Shangri-La Hotel, Kuala Lumpur. 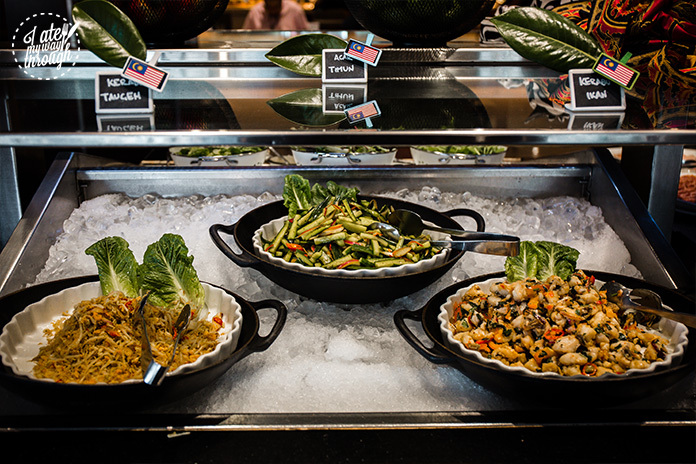 With influences that span from Thai, Chinese, Indonesian and Indian flavours, Malay cuisine is a true fusion of rich and spicy flavours. So without further ado, here is a little “Taste of Malaysia”. Starting off with some cold appetisers – the Kerabu Taugeh was a spicy bean sprout salad that had a nice crunch, the Acar Timum was spicy pickled cucumbers that had serious refreshing notes but my personal favourite was the Kerabu Ikan. This Malaysian style Fish salad was something that I have never had before so it was a true delight that was most welcomed. The fish itself was quite meaty and firm that seemed to be fried giving a nice crust on the outside. The flavours from the dressing of strong coriander, red onion and chilli all danced together in unison in order to create a symphony of flavours. 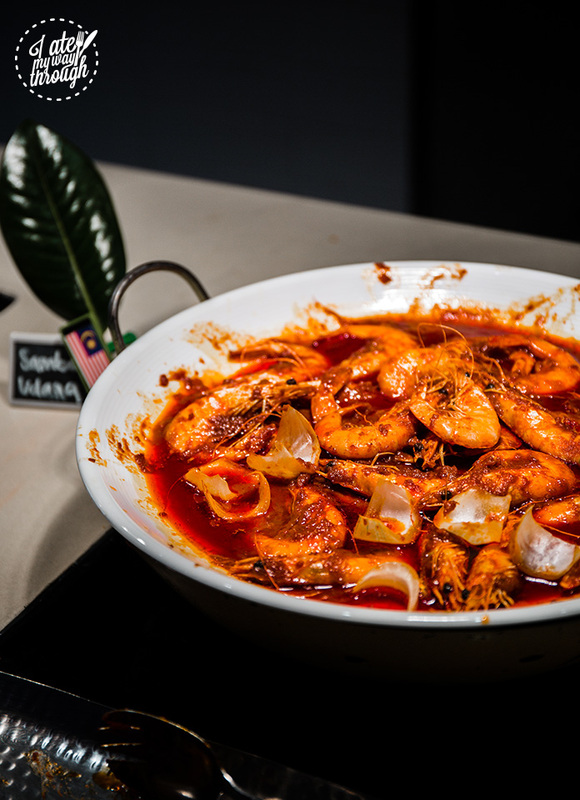 The Sambal Udang or Prawn Sambal was also a highlight. The Sambal sauce itself was very complex with a developing heat thanks to the mixture of chilli peppers. 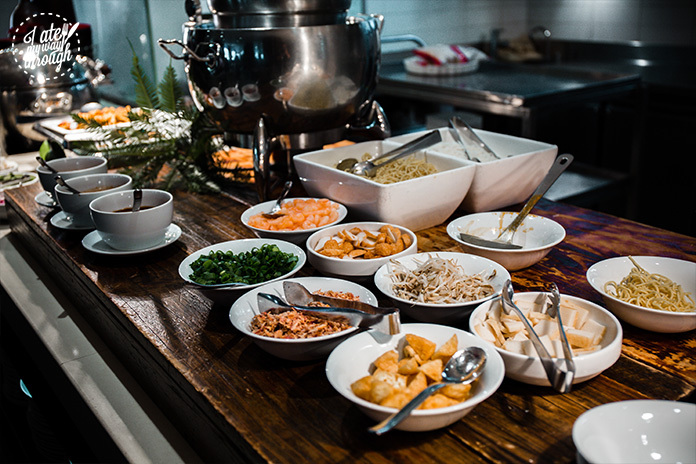 The flavours that followed were little hits here and there; I could taste saltiness from shrimp paste or a fish sauce, garlic, ginger, a subtle sourness from lime juice and vinegar and ending on a sweet note from palm sugar. 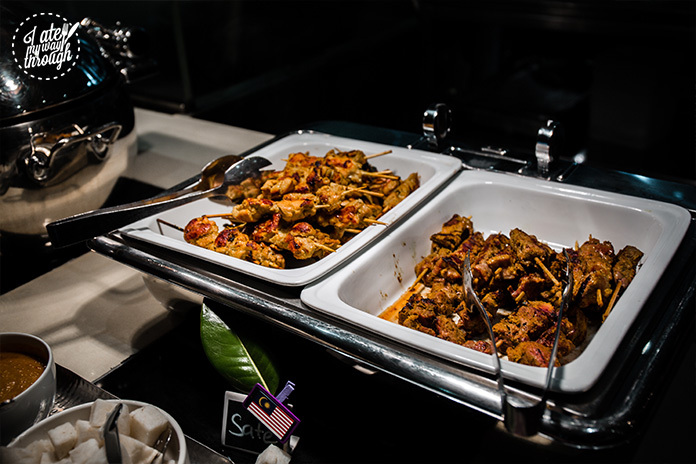 Bringing the Indonesian influences of Malay cuisine to the table, the sate (Satay) was a clear crowd pleaser. With its distinct yellow colour from the turmeric and lemongrass marinade, the chicken skewers were incredibly tender and aromatic on its own. Pour the satay sauce over the top and you are in for a treat. The sauce was full of richness with subtle heat from chilli, a hint of acidity from tamarind or limejuice, a sweet note from palm sugar and an incredible nuttiness and creaminess from peanuts being added. Now to end savoury on a high, how can you not go for Curry Laksa. Typically served with rice vermicelli or a yellow noodle with a serving of a spicy soup broth. I opted for the yellow noodle option with a bit of every condiment offered; from fish cake, tofu, prawns, bean sprouts and fried shallots. The broth itself was incredible. Very well balanced between the salt, spice, creaminess, sourness and sweetness. Each condiment made each bite different from the last, giving a rather fun textual experience as well. For desserts, I went down the fusion route with the Honey cake. 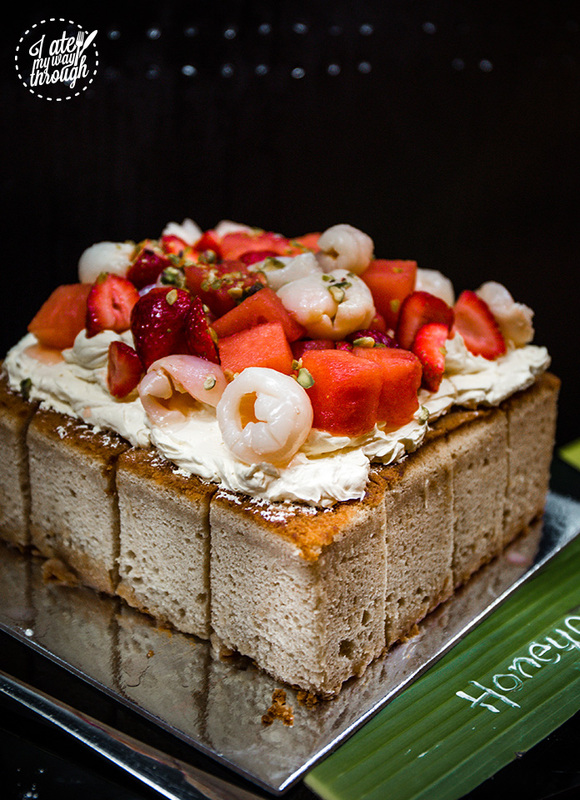 With a honey sponge cake base, it was topped with a vanilla butter crème and crowned with an assortment of fruit including, lychees, watermelon and strawberries and a sprinkling of chopped pistachios. This was so dear to me because those 3 fruits are actually my all time favourites. The sponge itself was so light and fluffy and still so moist, while the vanilla butter crème was slightly sweetened and added creaminess to every bite. These fruits all shined through with their natural sweetness and flavours melding well with the other components of the dessert. 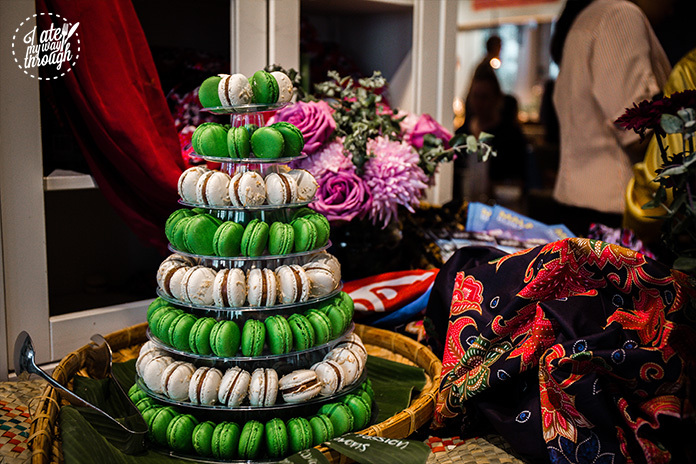 The macaron tower consisted of coconut and passionfruit as well as pandan and caramel macarons. The coconut and passionfruit were delightful with the coconut bringing a subtle sweetness but strong aroma of the tropics and the passionfruit worked well with ending on a tart and slightly sour note. However, the pandan and caramel macarons were my favourite. I’ve grown up to think of pandan as “Asian Vanilla” and that is so true. 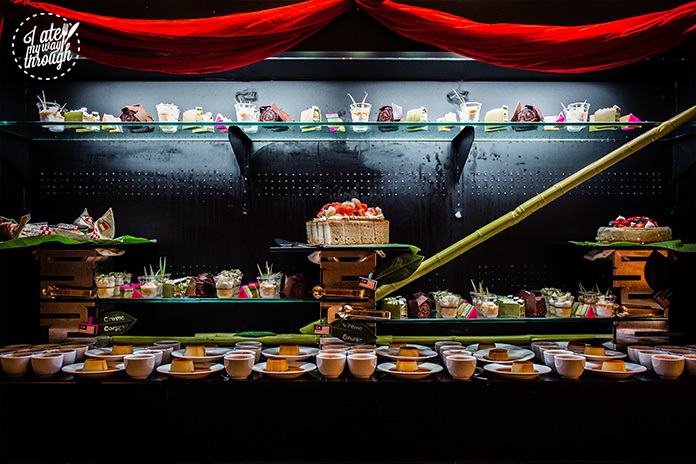 The pandan was very fragrant while the caramel was just sweet enough without it overpowering your tastebuds. The macaron shells were cooked just right with a crunchy case that complimented the cream fillings. 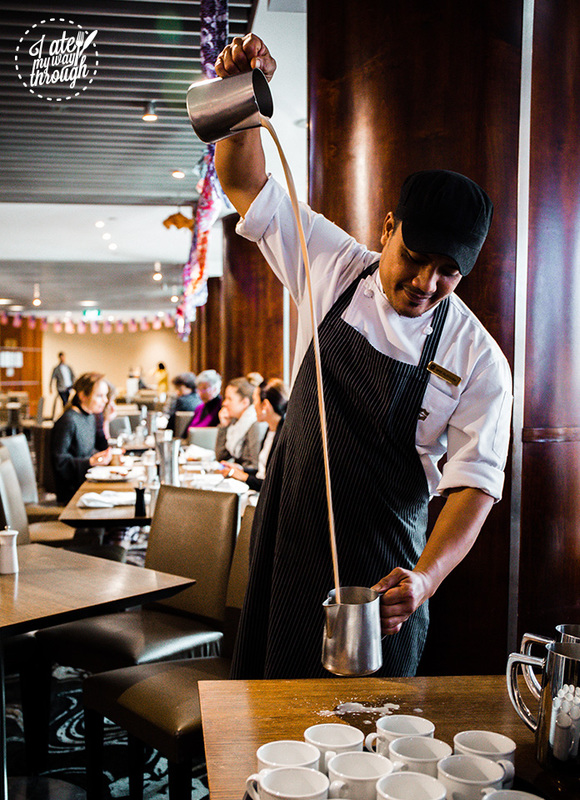 To end with a bit of theatrics, we were shown a traditional pouring of a Malaysian beverage – Teh Tarik from Executive Chef Hemant Dadlani. Translating to “pulled tea”, the hot beverage is prepared by repeatedly pouring the mixture between two jars from a height which gives it the signature frothy top. I thought of this as an upscale “milk tea” you get from those Bubble Tea stores. The black tea shone through the creaminess and sweetness from the condensed milk being mixed through the preparation. 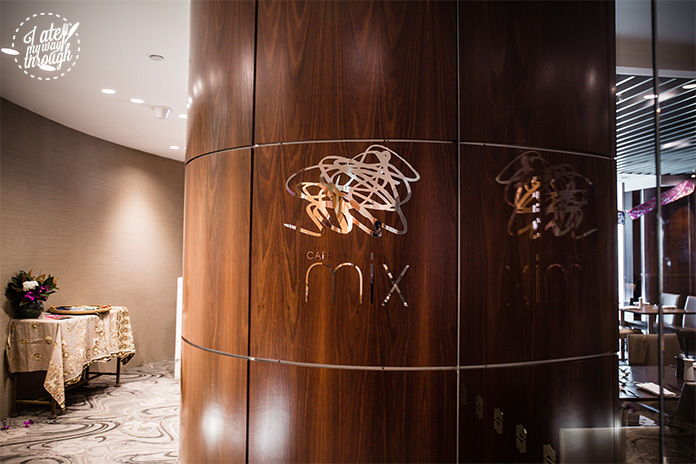 This experience at Café Mix is one that I’ll never forget. Having a beginner’s experience with Malay cuisine before this, I can now see why it is a cuisine that is on the rise. With its strong, bold flavours that for sure pack a punch, Malay food is definitely a world of flavours that I suggest everyone needs to try!